Twice a year, Piper Classics, a country home décor and furnishings company, works with Imbue Creative to design their seasonal catalogs. Both Piper Classics’ Fall/Winter and Spring/Summer catalogs feature beautiful images of their latest products and Imbue Creative helps to present them in a way that allows consumers to imagine how certain items will fit into their own homes. 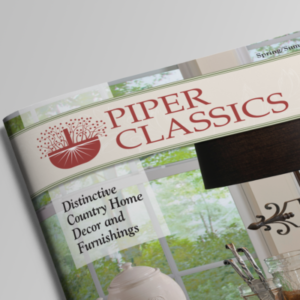 As a home retail brand, Piper Classics relies on their biannual catalogs to reach their existing customers and generate interest about their latest products. That’s why they turn to Imbue Creative year after year to handle layout, photo selection, color correction, and overall artistic design for each of their catalogs. Each year Piper Classics debuts new product lines and in turn, Imbue Creative helps present them in the most beautiful way possible.